Get In Touch For The Best Price! What is the Mavic 2 Dual? The new DJI Mavic 2 Enterprise Dual comes with both a standard RGB sensor and an integrated, FLIR branded radiometric thermal sensor. This makes it the most powerful, flexible Mavic that DJI have ever produced. The Mavic 2 Dual provides commercial drone pilots with the ability to see both standard RGB images and radiometric thermal data. Pilots can measure temperatures and immediately store thermal data. This gives you the ability to make decisions more quickly and ensure the safety of the public and their property. The range of data the DJI Mavic 2 Enterprise Dual can capture makes it useful in a wide range of commercial, industrial and emergency scenarios. All of this is available at a price point that makes the Dual a "must have" for commercial drone operators and emergency services. "With the Mavic 2 Enterprise Dual, we are enabling safer operations in more diverse environments so operators can focus on accomplishing their missions"
What Thermal features does the Mavic 2 Dual Offer? 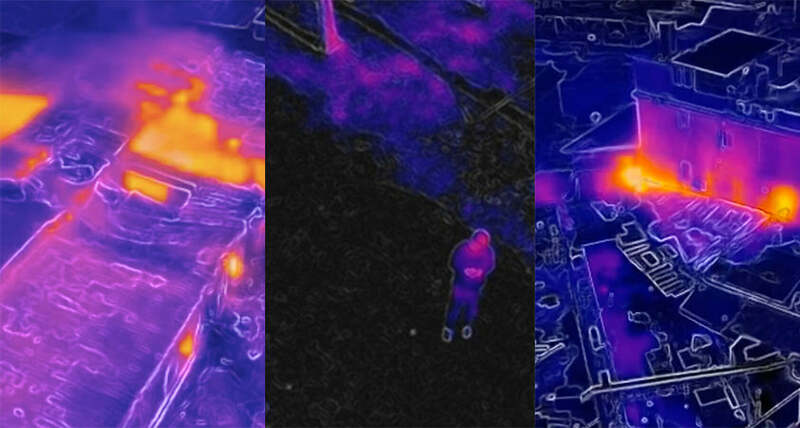 Combine thermal imagery and normal images in real-time to help identify temperatures in the real world. This function of the Mavic 2 Enterprise Dual allows you to measure temperatures at specific points. This function allows you to take the minimum, maximum and average temperatures in a given area. There are a number of Isotherm profiles available on the Dual Mavic 2. This allows you to isolate certain heat signatures with ease. For example, if you set the Isotherm to the temperature of a human body, any people in the area will be much more visible on the feed from the Mavic 2 Enterprise Dual as they will be much higher contrast. Whether you're searching for people, fire or a custom temperature range, Isotherms can help. Of course - all of the imagery captured by the Mavic 2 Dual is stabilised using a three-axis gimbal - giving you smooth live feeds, video capture and impressive stills. The Mavic 2 Enterprise Dual is also compatible with the standard payloads that the Mavic 2 Enterprise offers. In addition, the Mavic 2 Enterprise Dual will come with the same great features of the standard Mavic 2 Enterprise, including password protected data, GPS timestamping, advanced obstacle avoidance and more.